The over-friendly canine was offered a new job working for the Governor of Queensland, where he holds the official title of Vice-Regal Dog. Melbourne: Every dog has his day! A one- year-old German Shepherd was 'sacked' by a police academy in Australia for being too friendly but his social skills earned him a new vice-regal job at the Queensland Governor's mansion. Gavel was not found up to the task as he just loved rolling over and having his belly rubbed rather than standing to attention and looking menacing. The police dog-in-training failed to make the final cut for Queensland Police Service (QPS) in Australia because of his overly-sociable temperament. 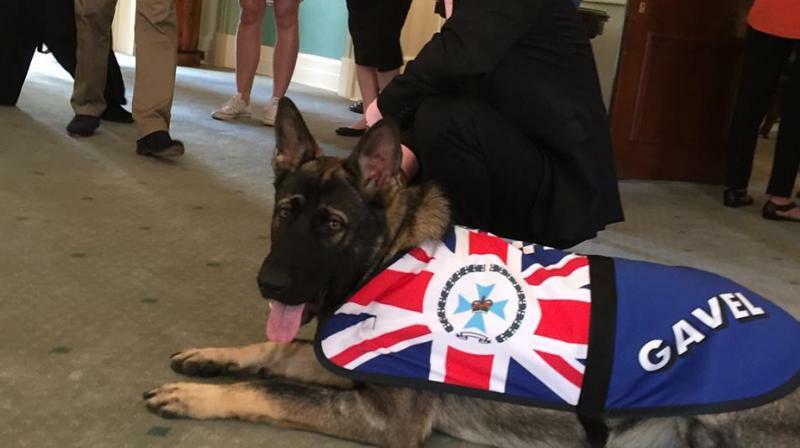 The pooch was fostered out to the Paddington residence of Governor of Queensland Paul de Jersey in April 2016 while he participated in a training programme at the police dog academy. "Life as a police dog was not to be after trainers ruled Gavel too sociable for the frontline," the Brisbane Times reported. Gavel loved meeting strangers and would much rather play with someone than help arrest them. The over-friendly canine was, however, offered a new job working for the Governor of Queensland, where he holds the official title of Vice-Regal Dog. His duties include greeting visitors to Queensland's Government House, and attending official functions with Governor Paul de Jersey. A spokesman for the Office of the Governor said Gavel had become a "valued and much-loved" part of Government House life. "Gavel on occasions sits in on briefings with the Governor," he said. "Gavel has also demonstrated his capacity to uphold the ceremonial importance of his role at State of Origin time," he said. Gavel was brought to the prestigious 40-acre Fernberg residence in Paddington, Brisbane as part of the 16-month dog squad training and socialisation programme. Despite having a prestigious family bloodline which saw him related to five current working QPS dogs, playful Gavel did not make the cut and was let go by the force.